Waking up in Sin City? Nothing will cure that debauchery-induced hangover better than the outrageous offerings and massive portions at Hash House A Go Go situated in the newly renovated center-strip hotel The Quad (formerly Imperial Palace). Pictured here: Andy’s Sage Fried Chicken & Waffles | Two sage fried chicken breasts with hardwood smoked bacon waffle tower, hot maple reduction and fried leeks. 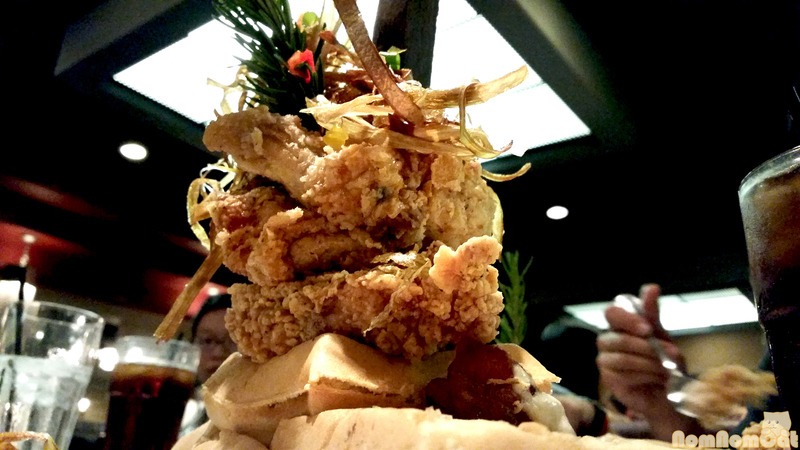 The chicken and waffles is a must-have and any menu item that has the word “tower” in it is no joke. The presentation is absolutely ostentatious — at the base is a stack of waffles that have strips of bacon cooked INTO the centers (like someone laid the porcine crack onto the waffle iron itself before sealing it shut), then two large chicken breasts with a beautifully crunchy coating, all topped with a pile of crispy fried leeks and stabbed through the heart with a giant steak knife and perhaps the longest sprig of rosemary I had ever seen (…aside from that one year in college when I bought a mini rosemary bush that had been trimmed to look like a Christmas tree). Luckily, the taste lived up to the hype of the many positive reviews, the glorious plating, and the grand procession as it is gingerly carried to your table. I will admit though, the excess bested me and I was not able to finish it on my own (it’s definitely meant for sharing!). The sweet maple reduction combined with the fatty greasiness of fried chicken skin contributed to the diminishing return, despite the blissful first bite. At just under $20, go ahead and splurge on this breakfast that is sure to soak up all that alcohol and keep you feeling satiated all day long. This post is part of the monthly link up party Our Growing Edge. This event aims to connect food bloggers and inspire us to try new things, and this month’s theme is dining out: eating at new restaurants, trying new dishes, or exploring new cuisines! We’ve been to Vegas many a time, but this was our first visit to the famed Hash House A Go Go… and you can bet we’ll be squeezing it in to our future itineraries, if only to satisfy my chicken & waffle cravings! This month is hosted by Ash at Organic Ash over in Auckland, New Zealand.